Markel Corp. is arguably one of the world’s leading insurance operator. It has one of the best track records in the insurance business with a very conservative management, accounting practices and a business model that is evolving to the size the Markel is growing to. We purchased Markel on the days after the acquisition of Alterra, when for a brief few days, the shares traded at book value. Since then, we have been sitting on it. As seen below, Markel has had a stupendous year, with both book value and the 5-year CAGR both doing pretty well. The 5 year book value CAGR is a good indicator for long term value creation for balance sheet driven companies. By and large, the letter is all good news. There is one painful section of the letter that I had a tough time comprehending — Markel Ventures. Markel has been on the tested path of Berkshire Hathaway, to own operating companies as an alternative capital allocation vehicle to investments. By and large, it has been fairly successful. Compared to ten years ago, the revenue has growth from $60M to $800+M. However, it was the discussion about EBITDA that caught my attention. Markel Ventures is measured based on adjusted EBITDA. EBITDA as a metric is bad enough but the metric goes even further and excludes goodwill impairment charges. The letter then goes through a painful section on how the goodwill impairment charges could have been avoided if the business had been lumped under a bigger business. I think since the entity was not bought as part of a bigger company, the goodwill must be evaluated at the entity level balance sheet. 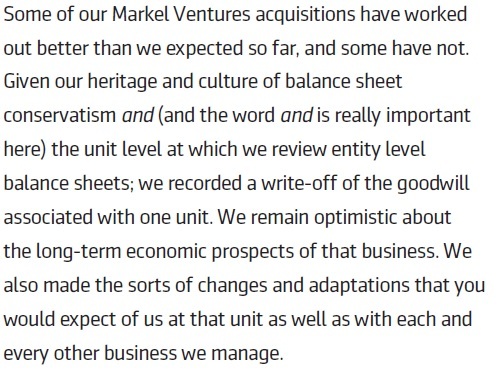 When one pause and thinks about it, it does not put Markel’s management in very good light. It will very important to keep track of Markel Ventures as it becomes a bigger piece of Markel. More disclosure in Markel ventures would be a welcome change in the future. Beyond that, the letter provided a good insight into the state of affairs at Markel. With Alterra being more conservatively reserved than before, the integration happening well, the insurance business performing robustly and the investment business roaring, Markel’s management no doubt deserves the trust of shareholders. The record that they have generated speaks volumes for the way the management runs the business. This is one no brainer compounding machine over the long run if bought at the right prices. At March 20th closing price of $778.5 and book value of 1.4, good performance is fairly baked in the price. It is no longer the bargain it was post the Alterra acquisition but definitely one worth holding in the books if one already has it. Disclosure: Own shares of Markel.